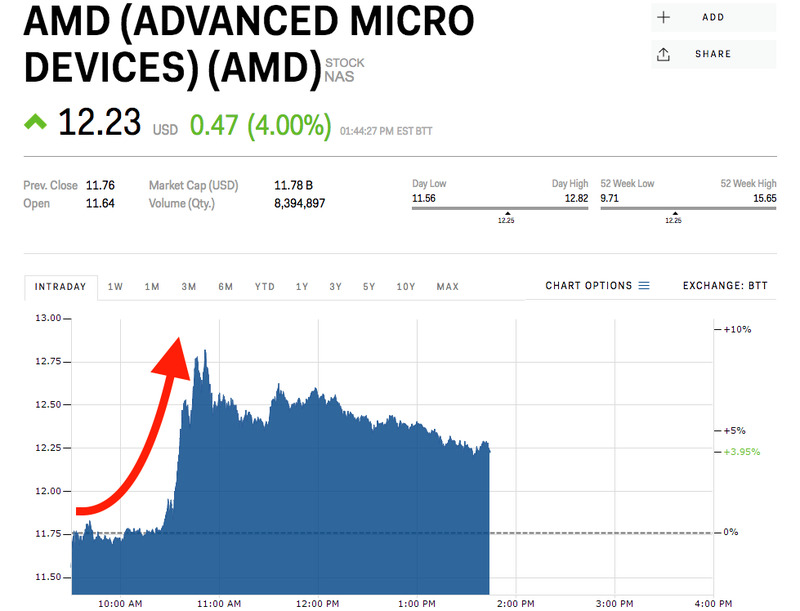 Shares of AMD (Advanced Micro Devices) jumped as much as 5% Wednesday as unconfirmed takeover rumours circulated around Wall Street, Bloomberg reported. It’s not the first time the semi-conductor stock has jumped on takeover rumours. Shares spiked on similar reports in October 2017 which turned out to be false. A growing proportion of revenue for all semiconductor companies, AMD included, is coming from cryptocurrencies. As the prices of bitcoin and other digital currencies have ebbed and flowed, so too have shares of AMD, Nvidia, and others. AMD is up 11.21% so far this year. Wall Street has an average target of $US14.87 for the stock – 20% above Wednesday’s prices, according to Bloomberg.